Get your cable free gaming GPU here…. 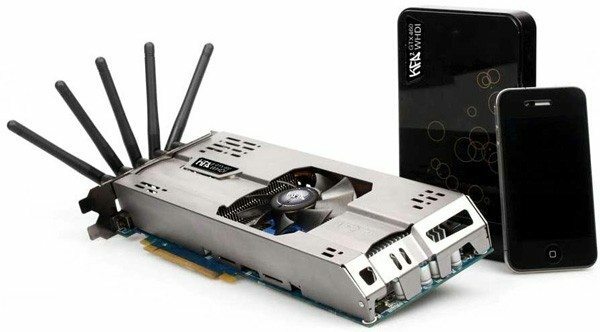 Galaxy sub-brand KFA2 has just announced their new KFA2 GTX460 WHDI nvidia based wireless graphics card. 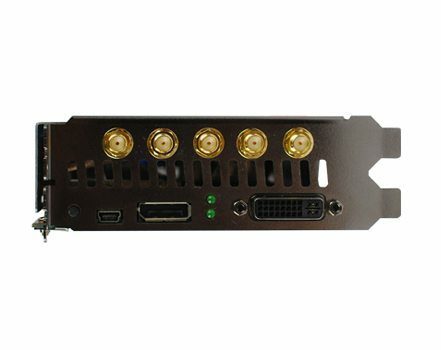 The KFA2 GTX 460 WHDI uses a wireless link (WHDI) to send the display output from your PC to your screen. You just need to attach the bundled receiver to the back of your monitor/screen and you’re done. The card’s name comes from Amimon’s wireless technology – WHDI stands for Wireless Home Digital Interface. WHDI 1.0 provides a high-quality, uncompressed wireless link which supports data rates of up to 3Gbit/s (allowing 1080p) in a 40 MHz channel, and data rates of up to 1.5Gbit/s (allowing 1080i and 720p) in a single 20 MHz channel of the 5 GHz unlicensed band, conforming to FCC regulations and worldwide 5 GHz spectrum regulations. Range is beyond 100 feet (30 m), through walls, and latency is less than one millisecond. The WHDI standard supports HDCP 2.0, so it can route protected content (Blu-ray films, for example) without a problem. Aside from having five aerials rather than display outputs, the card is a typical GeForce GTX 460 1GB affair. It supports Nvidia’s PhysX and CUDA technologies, and it’s DirectX 11-compatible. NICE, I want one :-).